While in London there was some controversy over ‘cyclist say back’ appearing everything from large trucks to small vans, Irish campaigners with a more positive message are having success. The Stayin’ Alive at 1.5 campaign have so-far convinced three local councils to use stickers advising motorists to give 1.5 metres space when overtaking bicycles. “Following Wexford County Council and Mayo County Council, we are delighted to announce Donegal County Council as the latest local authority to use the SAA1.5 message on their vans. Others too are in talks at the moment. Why not give YOUR local council a shout and ask them to become involved,” they announced on the Facebook page just over a week ago. 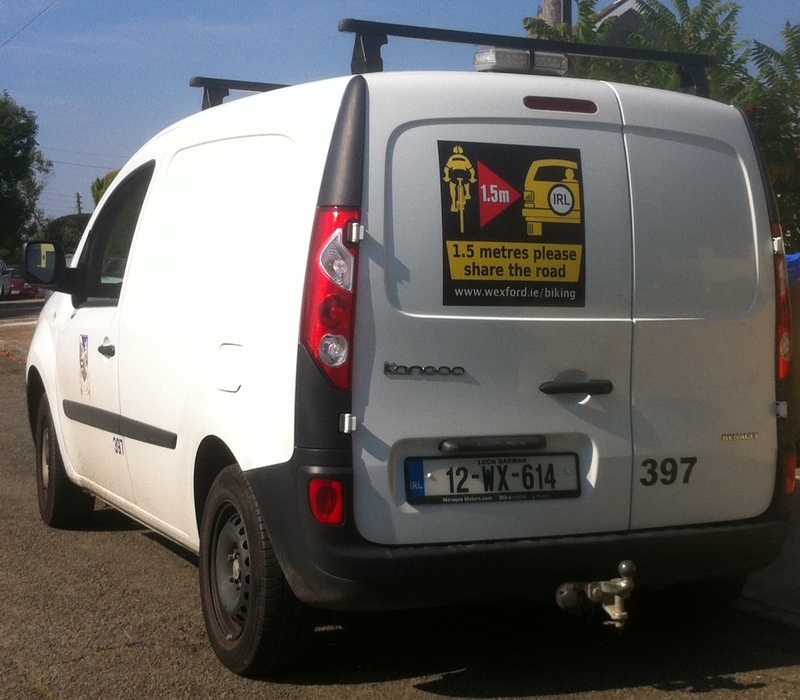 He said any council are able to purchase the decals for just €8.00 each when bought in a quantity of 4. IMAGES: A Donegal County Council van is pictured above, while Wexford County Council van is below. Sorry to be cynical but I very much doubt they will practice what they preach. This again look likes government thinking that they can change the mentality of road users just with signs ans stickers.